Herbert is a variety that is particularly known for it's excellent flavour, which is rich and tangy, rather than sweet. 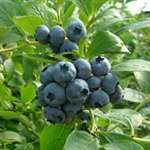 The berries are large and dark-blue. The fruit does have a tendency to be on the soft side which is why you are very unlikely to find it for sale in the supermarkets, but it still keeps well. The plants have an open, spreading habit and so will not grow as tall as some other varieties (1.2-1.5m) but do require more space around them. The leaves are naturally a light-green colour, and turn a brilliant, fiery-red in the autumn. Many thanks plant arrived in first class condition. very well packed. will use again. Superb plants and fantastically well packed - just as well as the delivery man couldn't see the side gate and threw the box over the main gates, and the plants didn't move about at all. good healthy plant, well watered before being packed. packaging robust, arrived undamaged. delivery was as specified; ie left by front door.